WALK: HeartSmart walk – Amberley Village. Time: two hours. Four-mile walk through Amberley village and back round the castle and along the River Arun. Meet: 10.30am at the car park at Amberley Station. FILM: Beast (15) – 12.45pm. Nothing Like a Dame (12A) – 1.30pm. The Guernsey Literary & Potato Peel Pie Society (12A) – 3.10pm. Sherlock Gnomes (U) – 3.45pm. Funny Cow (15) – 5.45pm. Lean on Pete (15) – 5.50pm. Bloodsport (15) – 8.15pm. A Quiet Place (15) – 8.30pm. Venue: Connaught Cinema, Union Place, Worthing, BN11 1LG. Box office: 01903 206206. Online booking: www.worthingtheatres.co.uk. FAYRE: Littlehampton District Lions Club Street Fayre in Littlehampton High Street with up to 25 local charities or non-profit groups raising money for their respective causes or providing information about the group. There will also be a children’s entertainer and a children’s fair. If you would like a pitch email: littlehamptonstreetfayre@gmail.com with your details or call 01903 918024. BOWLS: Tarring Priory Bowls Club open day from 2pm. Everyone welcome. Everything you need provided. All free. The club is in Church Road, behind Tarring Church. Visit tarringpriorybowlsclub.com for more information. FILM: Coco (PG) – 10.15am (Saturday morning picture). Sherlock Gnomes (U) – 12.40pm, 2.40pm, 4.40pm. A Quiet Place (15) – 6.40pm. Lean on Pete (15) – 8.45pm. Venue: Connaught Cinema, Union Place, Worthing, BN11 1LG. Box office: 01903 206206. Online booking: www.worthingtheatres.co.uk. EVENT: Homefield Park Bowling Club is holding an open day on Sunday, May 20, from 11am to 4pm with free tuition and equipment, and follow-up fun days on Tuesday, Thursday and Sunday from 2pm to 5pm. Outdoor bowls is a healthy way to keep active, make new friends and enjoy the summer sunshine, newcomers of all ages welcome. Members enjoy free parking. Call 01903 240056 or 07940 873813 for more information. FILM: Sherlock Gnomes (U) – 10.30am, 12.30pm. Nothing Like a Dame (12A) – 1.15pm. An American in Paris: The Musical (12A) – 3pm. A Fistful of Dollars (15) – 3.30pm. Lean on Pete (15) – 5.45pm. Funny Cow (15) – 6.15pm. A Quiet Place (15) – 8.20pm. Beast (15) – 8.30pm. Venue: Connaught Cinema, Union Place, Worthing, BN11 1LG. Box office: 01903 206206. Online booking: www.worthingtheatres.co.uk. 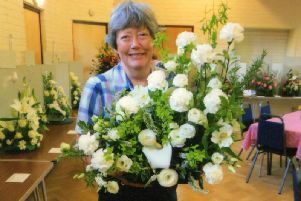 MEETING: Lancing Flower Club meeting with demonstration by Michelle King called Tutti Frutti. 2.30pm Lancing Parish Hall, 96 South Street, Lancing, BN15 8AJ. For more information visit lancingflowerclub.weebly.com or call Helen Taylor 01903 207255. TALK: Arun & Chichester (Air) Enthusiasts Society (Air ACES) talk entitled ‘The RAF - present & the future’, presented by ‘The RAF Presentation Team’. 7pm for a 7.30pm start at the Chichester Park Hotel, Chichester, PO19 7QL. Entrance for members is £3, guests £5 and under-16s free. Free coffees/teas and biscuits for all. For further information about Air ACES, please see www.airaces.org.uk, or call David Batcock on 01243 823007. FILM: Ghost Stories (15) – 11am (silver screen), 8.45pm. Beast (15) – 1.15pm. Nothing Like a Dame (12A) – 1.30pm, 6.30pm. The Guernsey Literary & Potato Peel Pie Society (12A) – 3.45pm. Sherlock Gnomes (U) – 4pm. Lean on Pete (15) – 6pm (subtitled). Funny Cow (15) – 8.40pm. Venue: Connaught Cinema, Union Place, Worthing, BN11 1LG. Box office: 01903 206206. Online booking: www.worthingtheatres.co.uk. ART: Textured Landscapes: workshop with Catherine Lawes at Colonnade House, 47 Warwick Street, Worthing, BN11 3DH, from 10am to 4pm. In this class you will play with layering strips of wool fabrics, many different textural yarns and crewel wools to create atmospheric and colourful pictures.Cost £40, all materials included. Contact Catherine directly to book via email: catherine.lawes@hotmail.co.uk or phone: 07580 709486. AUCTION: Worthing General Auctions, The Barn adjacent to the English Martyrs Church, Goring Way, Worthing, BN12 4UD. Viewing is from 5pm until the auction starts at 6.30pm. Admission is £1ppn and commission is ten per cent. Typically 350-plus lots. Hot food and drinks available on the night. All enquiries to Louise 07941 828599. FILM: The Guernsey Literary & Potato Peel Pie Society (12A) – 12.30pm, 8.30pm. Nothing Like a Dame (12A) – 1.30pm, 6pm. Ghost Stories (15) – 3.15pm. Sherlock Gnomes (U) – 4pm. Lean on Pete (15) – 5.45pm. Beast (15) – 8.15pm. Venue: Connaught Cinema, Union Place, Worthing, BN11 1LG. Box office: 01903 206206. Online booking: www.worthingtheatres.co.uk. JAZZ: This week at the Hare & Hounds, in Portland Road, Worthing, is The Clare Hirst Quartet. Clare Hirst has played with many of the country’s finest jazz musicians including Dave Newton, Alan Barnes and Art Themen. She is joined by Roy Hilton on piano, Godfrey Sheppard on bass with Milo Fell on drums. Music starts at 8.30pm but, to guarantee a seat, why not get there early and book a table for a meal. Call 01903 230085. WALK: Worthing Walking and Social Club five-mile walk from Littlehampton to Arundel. Ring Liz on 01903 268656 or Jean on 01903 419612 for more information. WALK: HeartSmart walk – Storrington. Time: two hours 30 minutes. Four-mile hilly walk down into Storrington and return with super downland views. Meet: 10.30am at the car park at Springhead/Kithurst Hill. FILM: The Guernsey Literary & Potato Peel Pie Society (12A) – 12.45pm. Nothing Like a Dame (12A) – 1.30pm. Beast (15) – 3.30pm. Sherlock Gnomes (U) – 3.45pm. An American in Paris: The Musical (12A) – 5.45pm. Lean on Pete (15) – 6pm. A Quiet Place (15) – 8.40pm. Ghost Stories (15) – 8.45pm. Venue: Connaught Cinema, Union Place, Worthing, BN11 1LG. Box office: 01903 206206. Online booking: www.worthingtheatres.co.uk. MUSIC: Morning Melodies presented by Marcus Martin – an hour of popular music from 11am to midday. Admission is free. Coffee and biscuits served from 10.30am. At Emmanuel United Reformed Church, St Michael’s Road, Worthing. This regular event invites donations and this month these will be going to Mellon Educate, a volunteer building project for primary school children in the poorest townships in South Africa. EVENT: The Arun Dementia Action Alliance is hosting the open forum as part of Dementia Action Week from 2pm to 5pm, at Arun Civic Centre on Maltravers Road in Littlehampton. Members of the public will have the opportunity to share their thoughts, concerns and opinions about dementia provision in the area, what we have already and what we need in the future. For further information call Julie on 07553 360964. FILM: Solo (12A) – 12pm, 2.50pm, 5.40pm, 8.30pm. Lean on Pete (15) – 1.15pm. Sherlock Gnomes (U) – 4pm. Venue: Connaught Cinema, Union Place, Worthing, BN11 1LG. Box office: 01903 206206. Online booking: www.worthingtheatres.co.uk.